Neck Coolers make awesome gifts, largesse, and site tokens for people in the SCA - or really, any other group that spends a lot of time outside in the hot summer sun, especially when mixed with exertion (armored combat, rapier combat, archery, equestrian, Habitat for Humanity/volunteering organizations...). What is a neck cooler? It's a long tube of fabric that has "magic crystals" (the watering crystals put in the soil of potted plants, found in the garden section) sewn into pockets along its length. When soaked in cool water, the crystals absorb water and swell up. Worn around the neck, the cooler slowly evaporates water over the course of hours, cooling the wearer. I raided my stash of scrap material to make these last year as largesse, and again recently as site tokens for the Pentamere Academy of Defense (with help from the event steward, Brigida, and another fencer, Aalis). I heard from a couple people that they were the most useful site tokens they've ever seen! The site tokens (not pictured) were made from simple white muslin, which then had a sword stencil spray-painted onto one end (to reference the Academy of Defense). I'm a huge proponent of site tokens that are useful, by the way. These, along with my small cedar satchel site tokens I made for 12th Night last year, are not only cheap and easy to make, but usable beyond the event. I love it! Cut strips of fabric, roughly 44" long by 3.5" wide. Fold them in half lengthwise, and sew down the long side - don't close the ends! Turn the tube inside out. I turn them very quickly using the safety pin method. I also found a video on turning them with a stick, made by the Barony of Cynnabar's own Genoveva von Luebeck! Sew a zigzag stitch across the center of the tube, sectioning it in half. Put 1/4 teaspoon of magic crystals into the tube, on either side of the center stitch. To make sure the crystals get down to right next to the middle stitches, put your 1/4 teaspoon into the tube all the way down to the middle, scrunching up the fabric, and then dump the crystals right in the center before pulling your teaspoon back out. DO NOT USE MORE THAN A 1/4 TEASPOON. It will seem like nothing - I know! - but they really do swell up like crazy. Sew zigzag stitches 4" away from the center stitch line, trapping the magic crystals into 4" pockets in the middle. Put 1/4 teaspoon of magic crystals next to these new stitch lines (1/4 teaspoon on each side). Sew zigzag stitches 4" away from the outer stitch lines, trapping the magic crystals into two new 4" pockets. You should have four pockets total, centered, each with 1/4 teaspoon of crystals inside. Finish the ends however you want! I simply turned the ends inside a little and secured them with a zigzag stitch. Add any decoration you want - spray paint the ends with a design, etc. Additional tip: whenever making a large batch of these, I chain-stitch them as I go - meaning, I still stitch one of them, backstitch, and then put the next one right up next to it in the presser foot and start the backstitch on the next one without cutting threads between them. Then I just snip the threads between the batch when I'm done. It's much quicker, because I'm not stopping to snip threads for each individual cooler at each step. It also saves thread, because there's no ends to cut between them - the thread goes immediately from the end of one stitch into the beginning of the next (with maybe a couple millimeters of thread in the middle). You can see one that's been soaked and used above - the middle sections are all puffed up. They get very full on just 1/4 teaspoon, believe me! 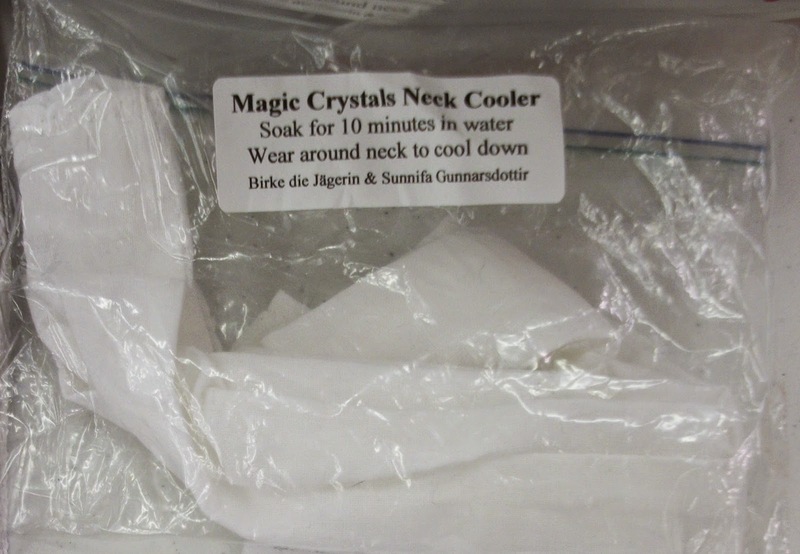 You can also package them up inside little baggies, with a simple label with instructions on it: Soak for 10 minutes in water and wear around neck to cool down - so easy!